I’m not terribly familiar with Leon Wieseltier’s writing – he being the literary editor of the New Republic. But I just came across a commencement address he recently delivered at Brandeis that is about as rousingly superb a defence of the humanities as I’ve ever seen. For decades now in America we have been witnessing a steady and sickening denigration of humanistic understanding and humanistic method. We live in a society inebriated by technology, and happily, even giddily governed by the values of utility, speed, efficiency, and convenience…. The machines to which we have become enslaved, all of them quite astonishing, represent the greatest assault on human attention ever devised: they are engines of mental and spiritual dispersal, which make us wider only by making us less deep. There are thinkers, reputable ones if you can believe it, who proclaim that the exponential growth in computational ability will soon take us beyond the finitude of our bodies and our minds so that, as one of them puts it, there will no longer be any difference between human and machine. La Mettrie lives in Silicon Valley. This, of course, is not an apotheosis of the human but an abolition of the human; but Google is very excited by it. In the digital universe, knowledge is reduced to the status of information. Who will any longer remember that knowledge is to information as art is to kitsch-–that information is the most inferior kind of knowledge, because it is the most external? A great Jewish thinker of the early Middle Ages wondered why God, if He wanted us to know the truth about everything, did not simply tell us the truth about everything. His wise answer was that if we were merely told what we need to know, we would not, strictly speaking, know it. Knowledge can be acquired only over time and only by method. And the devices that we carry like addicts in our hands are disfiguring our mental lives also in other ways: for example, they generate a hitherto unimaginable number of numbers, numbers about everything under the sun, and so they are transforming us into a culture of data, into a cult of data, in which no human activity and no human expression is immune to quantification, in which happiness is a fit subject for economists, in which the ordeals of the human heart are inappropriately translated into mathematical expressions, leaving us with new illusions of clarity and new illusions of control. Well, I feel sorry for the oft-neglected morphologists, neglected again. 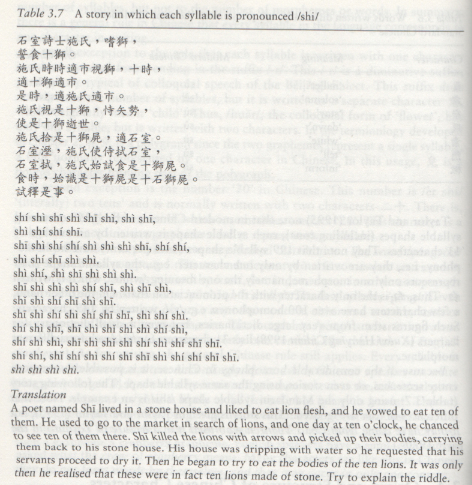 As the bridge between phonology and syntax, their work tends either to be tacked onto the former or the latter, for some reason, denied sovereignty. Obviously the main purpose was to give some general sense of the range of linguistic enterprise while having some fun at the same time (can’t syntacticians function with young children?!). It’s interesting how little the general public still knows about what linguists do. The most common view of course is that “linguists” simply learn many languages, ie that they are polyglots, rather than that they study language as such. 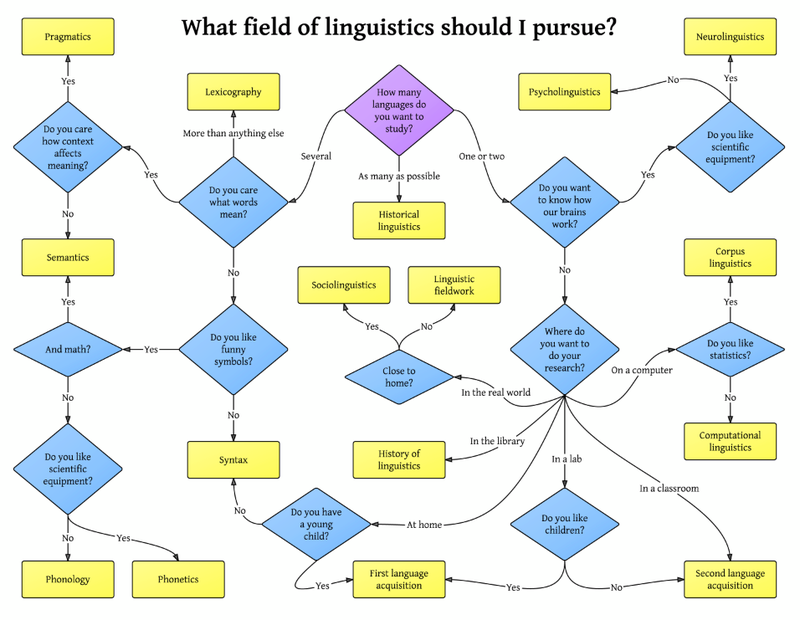 So this chart may be helpful in giving a sense of the range of areas involved in the study of language, even if a little (tongue-in-) cheekily. The New Republic has a wonderful appreciation, by Peter Green, of Paul Scott and his Raj Quartet (available in two handsome volumes in the Everyman’s Library here and here). Green met and became friends with Scott during the war, in Calcutta, then later, back in London and interviewing for a literary agent in the ’50s, he found himself, purely coincidentally, seated across a desk from him. Scott served him as agent for six years, at which point – in 1960 – he became a full-time novelist. Several years later Green moved with his family to Greece for eight years, and then took up an academic post in the US (he is an esteemed classical scholar). So for the most part their contact during the last 15 years of Scott’s life was limited to letters. What has always astonished me about The Raj Quartet is its sense of sophisticated and total control of its gigantic scenario and highly varied characters. The four volumes constitute perfectly interlocking movements of a grand overall design. The politics are handled with an expertise that intrigues and never bores, and are always seen in terms of individuals. Though Paul always saw the inevitability, and the necessity, of an end to the British occupation, and exploitation, of India, he still could see, and sympathize with, the odd virtues that the Raj bred in its officers. No one—certainly not E. M. Forster—has ever produced a subtler, more nuanced, picture of the Raj in action during its last fraught years, or of the seething, complex, and wildly disparate nationalist forces arrayed against it. The Quartet remains a tour de force virtually without rivals. The question is, how? How did this middle-class suburbanite—who left school at fourteen, had no experience of diplomacy or the civil service, in India or anywhere else, and never set foot inside a British university in his life—suddenly, after a solid but hitherto no more than middling literary career, acquire the vision that brought the world of the fading Raj to unforgettable life, in a quartet of novels that for range and power have been compared to Tolstoy? Suggestions have not been wanting, most notably that his experience on the wrong side of the rigid social divisions operating in pre-war London suburbia gave him a sharpened insight into both native caste distinctions and the even more absolute British color-bar that he found in India. Others have pointed to his sexual ambiguity… There may be some truth in both of these theories, but since both stem from Paul’s early life, why did they not have the same transforming effect on his early fiction as they are alleged to have done on The Raj Quartet? The difference is as total, and as extraordinary, as the still not fully understood process by which a chrysalis becomes a butterfly. This one took me by surprise. 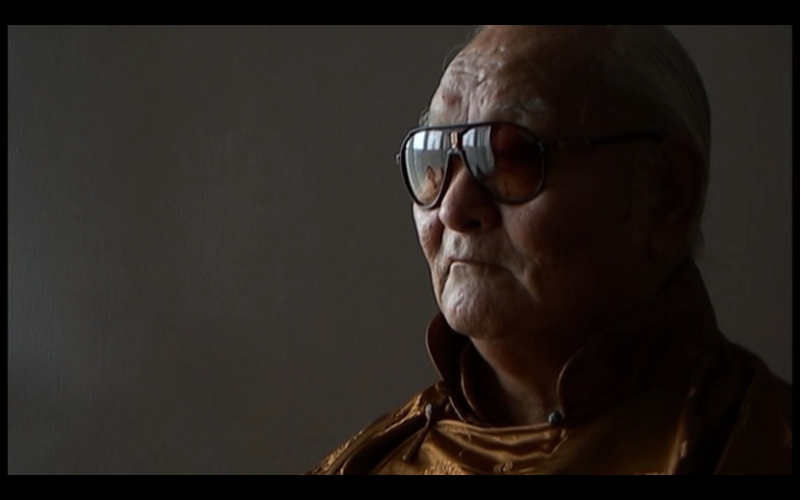 It’s a film documenting the relationship between the Dzogchen teacher Namkhai Norbu and his son, now known as Khyentse Yeshe (Dzogchen is a term indicating the pinnacle and most direct path within the ancient Nyingma tradition of Tibetan Buddhism.) 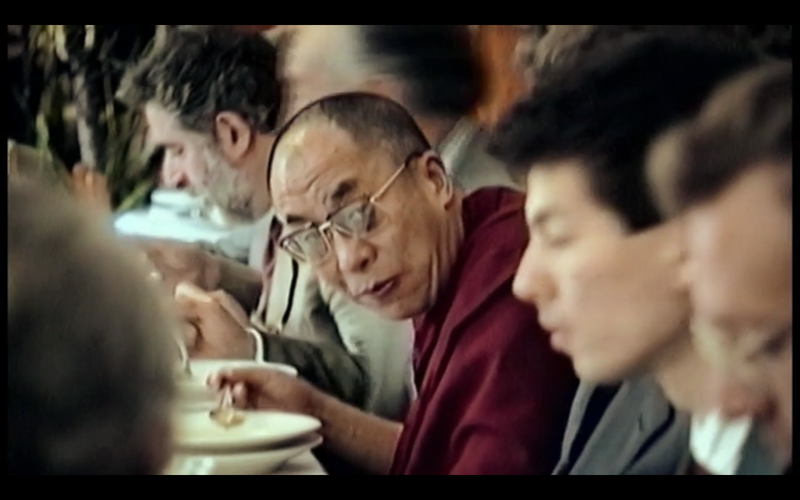 Filmed over the course of 20 years by Jennifer Fox, it surely must represent the most intimate visual portrait of a Tibetan lama to date. At times watching it, in fact, it’s hard to fathom how a family would put up with that degree of intrusion for so long: we see them at the dinner table, preparing for teaching events, and discussing all kinds of personal matters. It caused me to remember a comment in one of Trungpa Rinpoche’s books, to the effect that a bodhisattva has no room for privacy in their life at all, is completely open to the demands of the world. Namkhai Norbu, like a number of eminent teachers but unlike so terribly many more, managed to escape over the mountains from Tibet in 1959, during the Chinese invasion. He ended up in Italy, where he still lives, and married an Italian woman. At the beginning of the film his son Yeshi – as he was then called – is about 17, deeply respectful of his father but not all that connected to the practice of buddhism. We hear him lament the relationship he has with his father, which lacks the kind of ordinary, Italian familial warmth he wishes for. But that relationship contains an added wrinkle, because Yeshi, when still in his mother’s womb, was “recognized” as a tulku, the rebirth of a lama – in this case Namkhai Norbu’s own uncle, Khyentse Rinpoche (not the most famous such with this name, Dilgo Khyentse Rinpoche, but a lama who died in Tibet at the hands of the Chinese). Without pressuring his son either to take up his vocation or even to practice, he nonetheless has made it clear how important a responsibility he feels is on Yeshi’s shoulders. And many others around him, too, have high expectations and await the time when he will begin to manifest as a teacher. Yeshi himself remembers many dreams he had at a young age of particular places in Tibet he had of course never seen. However, he chooses a job in the business world, marries, and begins raising a family. 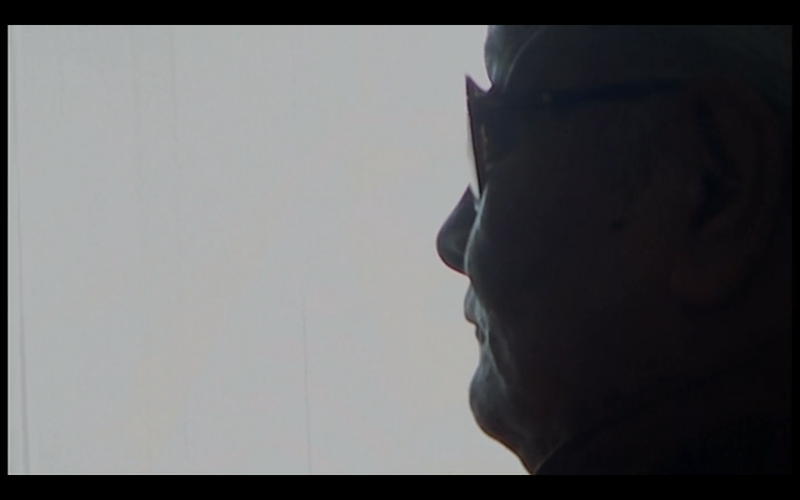 The film moves leisurely through the years, giving us glimpses of Namkhai Norbu teaching and relating to his students. We see him, very ill, in a hospital bed, and then well again and out in the world (having decided, he says, that he needed to stay alive and continue teaching). 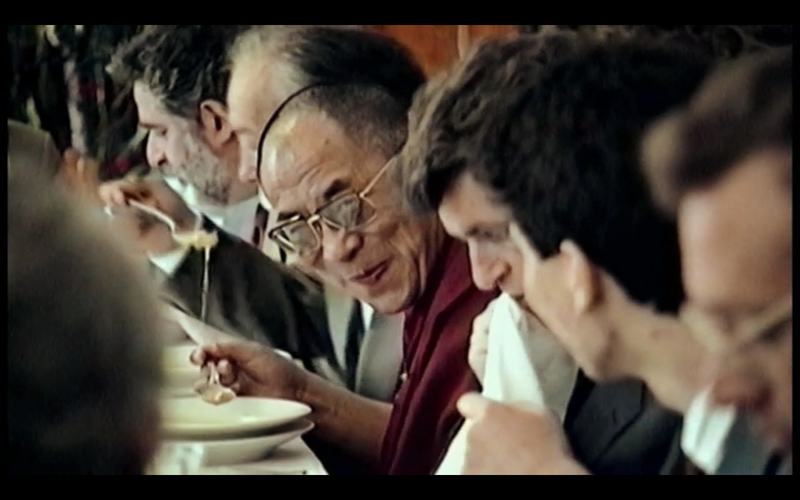 And we also see – a highlight of the film – wonderful and equally up-close footage of the Dalai Lama during a visit to Italy (in the stills below Yeshi at about 17 is in the foreground). 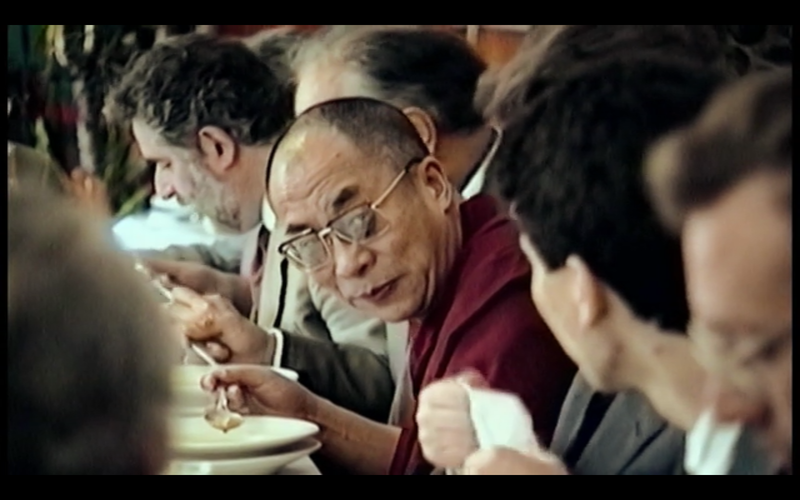 Those for whom the entire tulku system is alien and maybe even suspect might not know what to make of this portion of the film. I place myself somewhat in the middle between such a group and those who have strong faith in that system – though probably a little closer to the former – yet I found these scenes very moving. In fact, I liked this so much I ended up watching it again a couple of days later… All in all, quite a beautiful look into the life of a beloved Tibetan lama, the pressures and difficulties of being a son of whom very much is expected, and the journey which the latter takes to come fully into his own.